Today I was thinking about several distinct examples of love I’ve seen in the past few days. We had a nice lunch, then we took them to our afternoon worship service to say greetings (below), and then Eric drove them to the airport. Bryan and Linda had been on a short-term team that had come to work with us in Sanda two years ago. 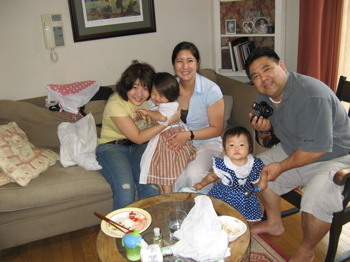 During that time, they stayed with a non-Christian family we didn’t know well for a one week homestay. Despite some challenges during that time, we were impressed with their love for the M. family. Last year, the M. family went to LA to visit Bryan and Linda, and they had a great time going all over the place. This spring, a member from their former short-term team was sharing in church about the importance of the relationships that were established when they visited Sanda. 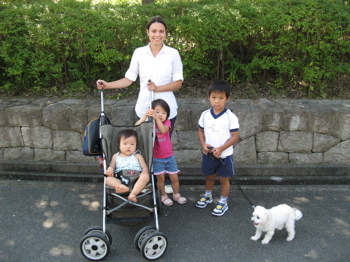 Bryan and Linda felt called to continue their relationships with the M. famiy, and so they gave up other vacation plans and made a trip back to Japan- to spend the week with the Ms. Thanks to Bryan and Linda’s visit, we have become reacquainted with the M family, and Mrs. M. is planning on attending an event that we are doing next week with the team coming in. I think – that’s love. Thanks, Bryan and Linda, for modeling to all of us that relationships are central to the Gospel. We went through some great missionary training (Wycliffe’s training on Interpersonal Skills) a few years ago, and the basic premise was “It’s all about relationships.” In the end, our relationships –horizontally and vertically — are all that really matter. It’s been good to be reminded of that this week by my daughter, Bryan and Linda, and Laura. Hi, I am here in the states (San Francisco). I can’t remember how I discovered your blog but I do remember that when I did, I felt a kindship right away. 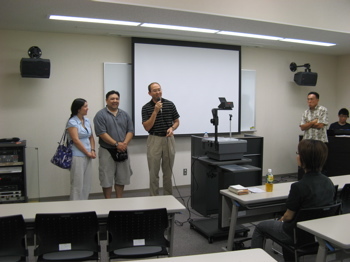 My wife, Yuka, and I are ministering to Japanese international students and I’ve recently accepted a position with JEMS (Japanese Evangelical Missionary Society). We are developing a ministry to students and then, when God has arranged everything, we will be in Japan discipling and encouraging returnees. I have written to let you know how encouraging your blog has been to me. It’s very full of love, joy, peace and the rest! Take care and may God continue to bless you with a growing sense of His sweet presence in your lives.